As the evening progressed, and before it got dark, a B-2 came flying in to the downtown Boston airspace and made TWO IDENTICAL circular flybys. In other words, it maintained a constant radius, constant banking angle turn, and flew right above the crowd that was assembled below. I was in that crowd. The wind was very light, and the direction was constant. There were no gusts. The altitude was surprisingly low, maybe around 1,200 ft, which surprised me. The altitude was constant throughout the maneuver. Now here’s the thing that made the hair on the back of my neck stand right up. The first time the aircraft approached and flew over us, the roar and vibration of the GE engines made themselves clearly known. But the second time the B-2 approached, there was an eerie silence. And I mean absolute silence. As it ‘flew’ above us, I was in a state of shock. There was no sound or vibration whatsoever. It looked like it was gliding, even though it clearly was under powered flight. After it passed us, I heard a few people around me (some strangers, and some members of my group) quiz each other about the lack of sound/vibration from the B-2 the second time around. So I know that I wasn’t hallucinating. As a recreational pilot and military technology enthusiast, I was probably more curious than the others in trying to acertain what I had witnessed, but in the following years I was not able to find anything to explain what we had seen. At least until I came across your literature and the industry insiders that spoke out briefly. The only other possibilities to your explanation is that the B-2 had noise-cancelling technology, or that what we saw was a projected image. Obviously the former has no military advantage and may not even be technically feasible, and the latter is highly unlikely. I believe what I saw was a real B-2, under powered flight. I believe your explanation to be the correct one. But then, my question is why did the Air Force very clearly demonstrate this classified technology so publicly? It doesn’t make sense to me, and I haven’t been able to shake off this question in my mind for the last 11 years. I hope you can help me answer it. Apparently, the crowd witnessed the B-2 flying in its silent field propulsion mode. In this mode the B-2 shuts off its jet engines and powers itself solely on scooped air. As explained in my 1993 paper The U.S. Antigravity Squadron” which is now updated in Chapter 5 of Secrets of Antigravity Propulsion, the B-2 in flight scoops air into its engine cowlings and this air is there seeded with ions to create a multimillion volt potential which the B-2 uses to power its electrokinetic ion drive. 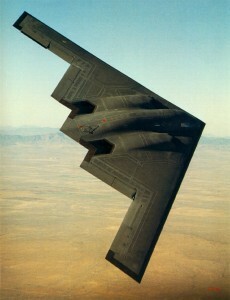 The fields induce asymmetrical electrostatic forces on the B-2 which propel it forward silently. This is an overunity drive: unbalanced forces create thrust, which scoops air, which creates multimillion volt potentials. As to why the Air Force would make such a blatant display, my guess is that it had already been used on the battle field and its silent cruise mode had in the past already been observed by enemy soldiers. Besides the U.S. Antigravity Squadron paper that reverse engineered the B-2’s propulsion system came out five years earlier in 1993. So perhaps by that time the Air Force had concluded they had nothing to lose. Sorry, I have no comment about the B2, but would love to see one fly. I enjoyed the book “Antigravity Propulsion”. I am looking to connect with anyone engaged in experimenting with these concepts. It seems independent research fizzled out around 2003 or so? Don’t know why. My own experiments seem to verify some things Dr. Laviolette concluded about Brown’s Gravitators. This sounds exactly like what I saw on 10-5-2012 around 11 PM at night. I was on my back porch and looked up. I saw a stealth bomber looking craft flying completely silently for around 8 seconds before it flew out of view because of some trees and the roof of my house. It was either black or dark grey (very dark colored). The way I saw it: I initially thought the craft was about 25-40 ft wide wingspan (stealth bomber “boomerang” flying-wing shaped) and flying low, maybe 300-500 ft. COMPLETELY silent. It had this reflective type of light around just the edges of the craft that helped to outline the craft. It craft itself did not have any lights on it like an airplane does. In other words this craft was not meant to be lit up I believe. The night was clear with a few scattered clouds but otherwise very clear and starry. I live in the East Bay and this area is well-populated and plenty of street lights etc (Hayward). It also had this sound-wave like distortion around the edges of the craft that distorted the air around it like a tail pipe of a car or other hot object distorts the air or a sound-wave distorts the air. I felt compelled to blink my eyes and shake my head a little to make sure what I was seeing was what I was actually seeing, which it was. The “distortion” around the craft especially gave me this sensation of wanting to blink my eyes and shake my head a little before looking at it more intensely. If you take your index finger and thumb and place them apart by 1.5 – 1.75″ this is the wingspan of the craft that I witnessed. Extrapolate the 172 ft wingspan of a B2 by this 1.5″ and you have the height it was flying at if indeed it was B2. Either way, it was flying low, really low. Background info: I saw this on Friday October 5th 2012 at 11:00 PM. I initially thought it was some sort of drone from the US government. I didn’t think the wingspan was as big as the 172 ft of the B2. Being the interested person that I am I actually made a report to MUFON (Mutual UFO Network) that night. The next day, Saturday October 6th 2012 I was talking to a friend and we thought it might be a drone, so we looked up all kinds of drones and especially what carrier based drones there are as Saturday was fleet week here in the SF Bay Area and there is indeed a carrier in San Francisco. We thought it might of launched from that and the Navy guys were having a little fun. Someone from MUFON emailed me Sunday and reminded me that the B2 had made an appearance on Saturday (only) at the fleet week air show event. He thought it was a good idea, and I agreed, to close the case as an IFO (identified flying object). I was left with this nagging feeling that I’ve never heard that the B2 can fly silently, which of course it hasn’t been revealed to be able to. I did some searching online and that is how I found your starburstfound site here. The situation you describe here sounds exactly like what I saw, minus the sound wave like distortion around the craft. I want to document what I saw because it is important that the free flow of information never cease. Hope my info helps in some way. Thanks.